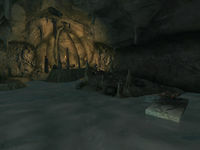 Veyond Cave is a large cave north of Bravil containing NPCs. It contains four zones: Veyond Cave, Veyond Black Waters, Veyond Sea of Darkness, and Veyond Great Sump. It is highly recommended to have Water Breathing capabilities when exploring this cave as a lot of travel and combat will occur underwater. In particular, the fourth zone is completely under water. For ease of explanation the walkthrough assumes the ability to breathe water. 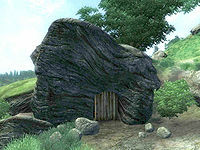 Not to be mistaken with the Ayleid ruin Veyond. This cave contains 20 Cairn Bolete plants and 54 Wisp Stalk plants. Most of these are underwater so keep an eye out even when the water only reaches your knees. 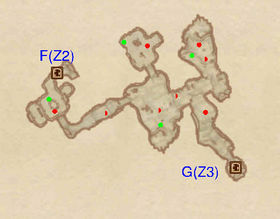 This location's map marker (M on map) is named Veyond Cave (editor name VeryondsCaveMapMarker). The entrance door is SSW of the marker, 50 feet away. Your very first oppponents are two mudcrabs, but don't relax as in the next room you will face the first two of many Argonians. 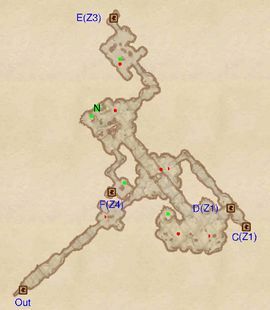 Once you've cleared the two minor loot chests head down into the water until you find the tunnel heading north. After a while you will need to swim through a section to reach the next room. One Argonian is swimming near the entrance; try to lure him back so you don't have to fight three enemies at the same time. 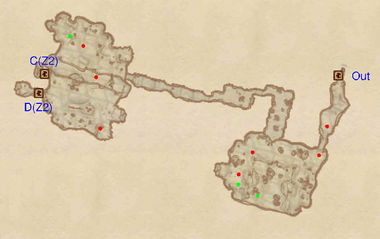 A minor loot chest is in the north-western corner. There are two doors (C and D), both leading to the Black Waters, although the former is underwater while the latter is on solid ground. 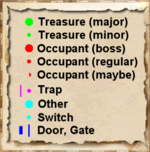 Door C allows you to avoid up to two enemies in the next zone at the cost of a minor loot chest, so use door D instead. 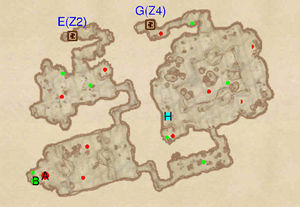 Enter from door D and dispatch the enemies guarding the minor loot chest in the north-western corner. The next tunnel is underwater and there is a circular hole midway through which leads further down into a room you can access from door C in the previous zone. It is likely that the Argonians below will detect you as you pass over it so be wary. In the next room a single Argonian guards a minor loot chest and a Nirnroot (N). Head to the north-east to a small room with an Argonian and a minor loot chest. You can access the Sea of Darkness from door E but for more efficient exploring head back to the previous room and head south. After looting the minor chest nearby, head to the Great Sump via door F.
When you return from the Sea of Darkness through door E a quick exit route is to jump down the hole to the lower, underwater section and exit the cave via door Out, which opens into the sea to the south east of the main entrance. When entering from door G be ready for a fight as you will immediately face an Argonian. The next room is rather large and may contain up to four enemies so try to use Sneak or to lure them back into the tunnel in order to fight them separately. In the south-western corner is a rather interesting scene: an Argonian Shaman is guarding a minor loot chest and a cauldron filled with skulls. 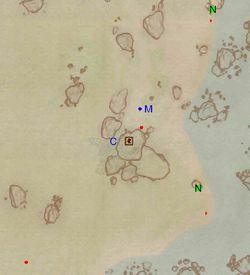 On a nearby islet is a dead Bandit (H) sprawled beside two skeletons; next to them is a stone altar upon which rest a dead Mudcrab, a portion of crab meat and various incision tools, including a silver dagger. On the opposite side of the room is a similar altar with a dead Slaughterfish and a portion of scales. Make sure you don't miss the minor loot chest found underwater in the middle section. After a small room with another underwater chest you arrive in a large room with three enemies, one of which is the Argonian Chieftain (A). It is a tough fight but well rewarded by the boss chest at B and minor loot chest nearby. The next room holds two more minor loot chests and two last Argonians defending them. When you're done, head back to Black Waters via door E.
This zone is completely underwater save for the very first room when you arrive from door F. There is a hole in the ground leading to the underwater section and the Argonian swimming right underneath it will very likely detect you. However, it is rather hard for it to get onto firm ground from the hole so you can easily dispatch your enemy with targeted attacks. The flipside is that it is also difficult for you to get back out once you've jumped in. Loot the minor chest nearby and dive in. The amount of enemies you face in the next room is variable: from none if you're lucky to three if you aren't. Don't miss the minor loot chest floating in the southern end of the room. Before leaving to the Sea of Darkness check the two northern rooms: both contain a minor loot chest guarded by one or two enemies. This page was last modified on 7 April 2019, at 17:50.